The Parallax Propeller is a unique multicore, multi-processing microcontroller with shared memory and a built-in interpreter for programming in a high-level object-oriented language, called Spin. Its eight symmetric 32-bit processor cores (also called "cogs") are united by shared memory, managed by a central "hub," and have common access to all 32 I/O pins. 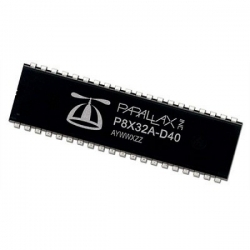 The P8X32A-D40 is most useful for prototyping in its 40-pin DIP package.